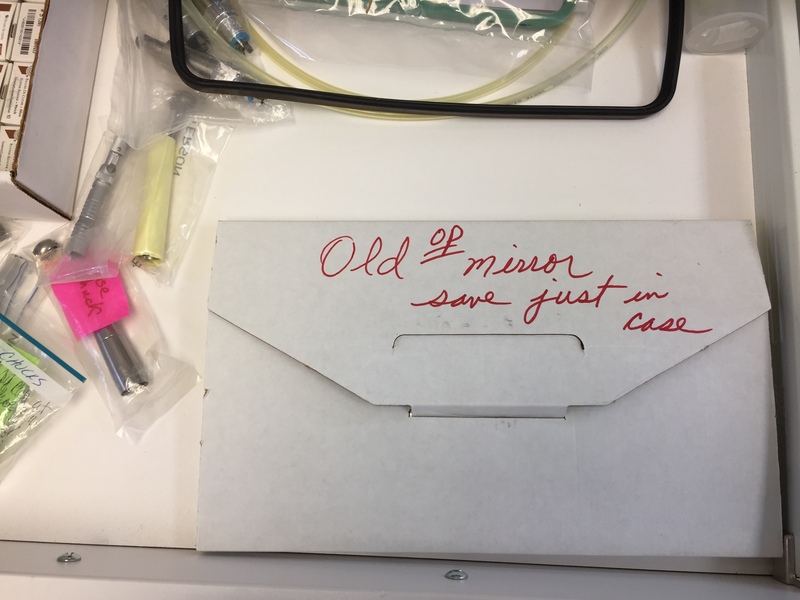 I pulled open a drawer in our office lab a couple months ago and found this note on a cardboard box containing a hand mirror. This is Monty’s handwriting. I couldn’t help but smile when I saw this – partly because I still miss Monty (who retired a year or so ago from our office) and partly because this puts into words what we experience so often in the dental field. This is 100% real. I couldn’t make this stuff up. Seriously. Our storage closet, just of Dr. Matt’s office. 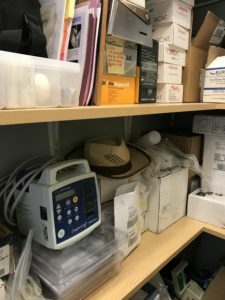 We have a closet, located in Dr. Matt’s office, that houses supplies and other important necessities – like this straw hat. It’s an organized mess. I was digging around in there with Nancy one day in an attempt to clean some things out and gain some additional storage space. 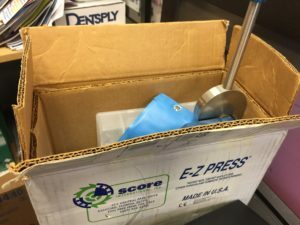 Among many other things, we found the box for our E-Z Press, a press that Matt used to replace the bearings in our dental handpieces. The E-Z Press was a great tool to have and saved us a ton of money by replacing the worn-out components in our handpieces ourselves and not having to send them out for repair. We don’t own any of those handpieces anymore. So why do we keep the E-Z Press around? You got it: Just in case. We have changed the artwork throughout the building a few times in the years we’ve been in the new office. 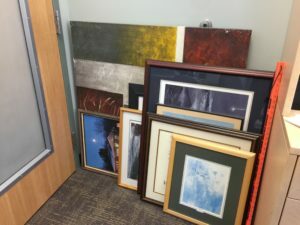 Behind the door of Dr. Matt’s office is a perfect place to store old artwork. Why do we hang into it? Just in case. Some of the artwork we’ve had up in the office over the years. You’d like to see a dental journal from the year 2013? Which month? We have them all! 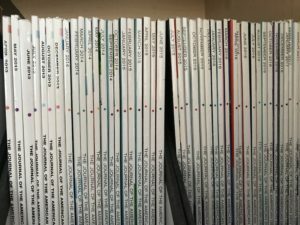 Dental journals from 2013 to present. Now, our office is not unique. Dr. Johnson, the dentist Dr. Matt purchased Pike Lake Dental Center from, saved a ton of stuff too. When we moved from the geodesic dome across the highway to our new building, we were able to get rid of a lot of old things that were obsolete. I’m pretty sure we also transferred a few things to our new building during the move. I finally passed along our old assisting chairs that belonged to Dr. Johnson this past summer to our nephews for their hunting shack. Out of our pole barn and into their hands. That was a small success. Dr. Matt also has saved this very special boombox from his college years. This little gem is housed in a closet at the office. If tapes ever make a comeback, we will be ready! 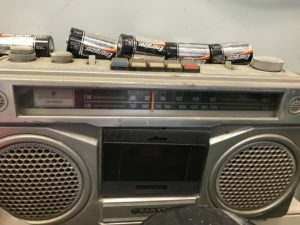 Dr. Matt’s boombox from the 1980s. An old door to the office? Don’t you worry – we have it in the shed! You never know when an extra door will come in handy. 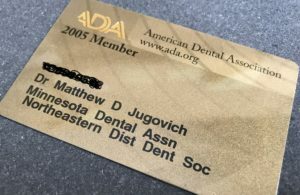 Dr. Matt’s ADA membership card from 2005? We’ve been saving it for just this moment! ADA membership card from 2005. We also used to save old hand instruments “just in case”. Nancy and I recently went through a big bin of instruments I had cleaned out of Dr. Matt’s desk drawer. He used to save them for patients who then used them for wood carving or in their garages. 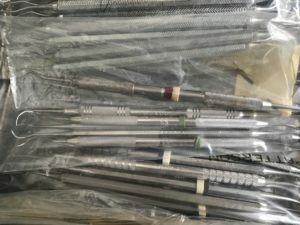 We had about 5 pounds of dental instruments we were able to recycle. It was a small win, but recycling all those instruments was a win! Sterile, but old, instruments ready to be recycled. Rest assured, we keep a clean and efficient office in the clinical and front desk spaces. Behind the scenes, in a closet or desk drawers or the shed out back, we also keep a lot of things we really don’t need. I think dentists in general are pretty cost-savvy and practical. Also, they never know when they might need something. In Matt’s defense, he is able to fix a lot of things within the office himself and having spare parts on hand is very useful in those circumstances. After so many years together, I figure the best way to look at the “just in case” things we have accumulated over the years is simply with a smile. Thanks for that ‘window’ into the corners of Dr. Matt’s office! It’s good to make fun of our quirks sometimes 😉 Oh….and that boombox is priceless!! !